Each Vijay has his own heroine and each couple gets a song. Otherwise, it's the same old songs and the same old Vijay, sighs A Ganesh Nadar. Mersal seems to have got the ruling party's goat -- not the ruling party in Tamil Nadu, where the movie is based, but the one in Delhi. Vijay acts like Vijay does in all his movies -- right from 1992 when he made his debut as a hero. Before that, he was a child artiste in his director-father Chandrasekhar's movies. Vijay also dances the same way in all his films, fights the same way and delivers punchy dialogues in the same manner. His looks have barely changed in 25 years. This is his silver jubilee year as a movie hero. Mersal, like every other Vijay movies, has innumerable songs picturised in exotic locations. The locations and the number of people involved in each song indicates the producers had plenty of money to spend and no qualms about splashing it around even after demonetisation. There is something more in this film. There are three Vijays! Then, there are other songs -- not involving the heroines, but where our man is omnipresent. The locale shifts from Poland to the streets of Chennai. The credits mention three stunt directors -- one from Mumbai, one from Chennai and one from Poland. Perhaps the makers didn't want to fly out stunt masters to different locations or maybe they thought they could make Vijay fight in a different manner after 25 years. No such luck. After a few months, you will forget the movie's plot. Even if you watch bits of it on television, you will have a hard time guessing which Vijay movie it is. All his movies look the same. What is important is that his fans adore him. The dialogue uttered by the comedian Vaduvelu that got the BJP's goat is delivered in Poland in chaste Tamil. Mersal talks about GST, bad hospitals and bad doctors during its final five minutes. If one has left the theatre earlier, you would miss it. Now that the BJP has beaten many drums about it, audiences wait eagerly for it. S J Surya, usually known for his loud performances, is a revelation in this film. He is the baddie and he performs with panache. 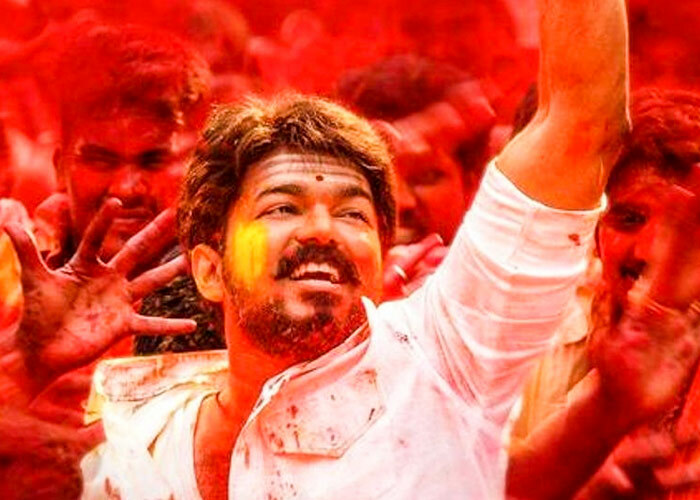 There is a dialogue in Mersal where Vijay says, 'Let me tell you like Vijayakanth,' a reference to the Tamil star-turned-politician who had 29 MLAs in the state assembly post the 2011 election. This is the first time Vijay has referred to someone other than MGR -- the late Tamil movie thespian and chief minister -- in his movies. In another action-packed scene, we have an MGR film playing where the legendary star walks onto the screen. Parallel to that, Vijay walks onto our screen. If this implies that Vijay aspires to be MGR, we can only sigh! In another scene, Vijay is strip-searched by the Polish police because he wears a veshti at the airport. Sathyaraj, now known to all of India as Kattappa from the Baahubali movies, plays an inspector who arrests Vijay. He looks surprisingly young, nothing like the elderly gent from the epics.